The seas were as dark as they could be. The only sounds that accompanied me crew's chatter were of the waves crashing on the hull. Sometimes, in darkness its easy to see a speck of light in the distance. Mystified we steered towards the light. We hoped that it was not the sea playing tricks on our eyes. As we closed in towards the light, a cool breeze blew over the warm seas. Soon enough, it was easy to see what the light was. It was a small island with a tavern and a restaurant on it. This Captain has seen many islands but this be the best kind. 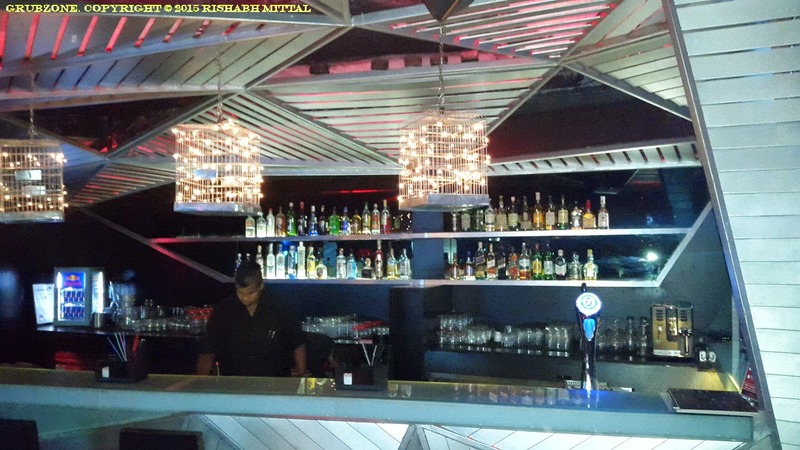 Tonic is a new place with a very relaxed ambiance. This place earlier belonged to Auriga which has now reworked itself and become two places instead of one. Two places at the price of one. Who would say no? The clubby pub Tonic sits at the bottom while the restobar Auriga floats at the top. On the day of my visit, it had a red dark lounge theme to it. However, they often change the color of the lights making the ambiance quiet dynamic. It could be red today, blue tomorrow and green on yet another day. Its often like entering a different place every time. 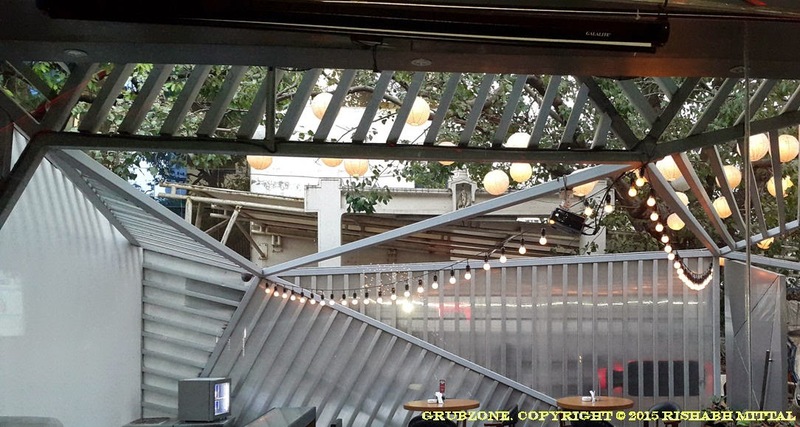 Although the appearance appears clustered, there is a large amount of space between the bar counter and tables. I feel that this may serve well for people who want to dance to the beats. 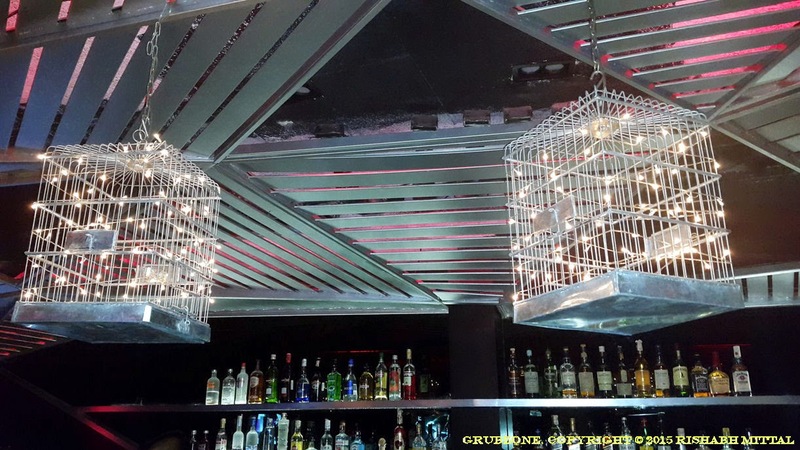 The steel cages with lights, hanging from the ceilings are the most attracting objects. While this peculiar decoration has no explanation for its presence. It does however stoke a sense of enigma. One could imagine lights rising in a dark club like fireflies and then they are trapped in a cage. Almost like the scene from Life of Pi with glowy thingies in the dark sea. The seats are made of nice studded leather although the lack of backs could be an issue for long sitting patrons. 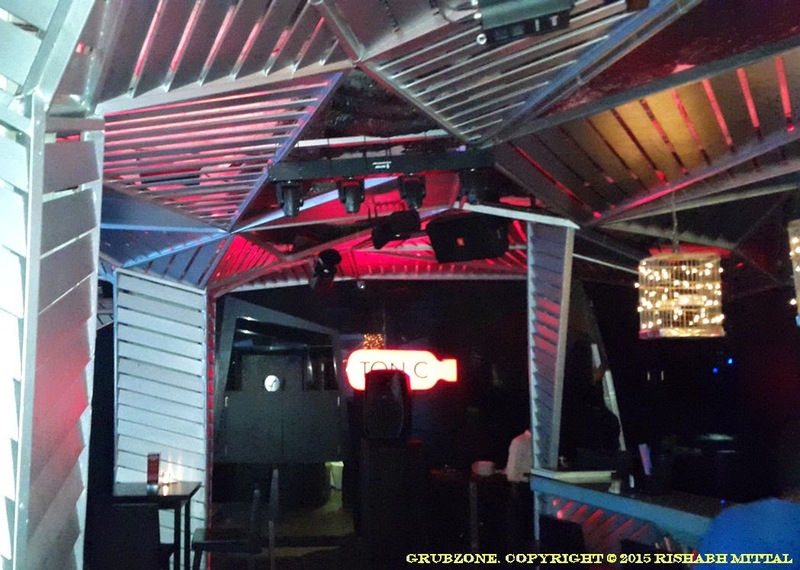 The immediate exterior of the establishment has a nice outdoor clubbing zone. There is also a screen and I am told that there will be 3D projection mapping over here in the not so distant future. For those who are unaware of what that is, its projecting images on flat and irregular surfaces with specially designed visuals and thus creating an illusion of depth. Think of it as 3D without the glasses. Its time to drink the tonic and power up to the next level. And thus I sampled some of Tonic's in house specials. They use a novel concept of Batli(Bottle), Barni(Jar) and Balti(Bucket) while serving the drinks. Batli serves to cater a few people. Barni is moving up on the scale and if you really feel like going on a merry night with a large party, go with the Balti. But for me its more like Beginner, Expert and Advanced levels in a Video game. If you know what I mean. The Mad Scientist(Maniacal laugh Ha ha ha- Sorry had to do that) will make you feel like an unappreciated intellectual on the breakthrough of something that will change the world - for better or worse who knows? 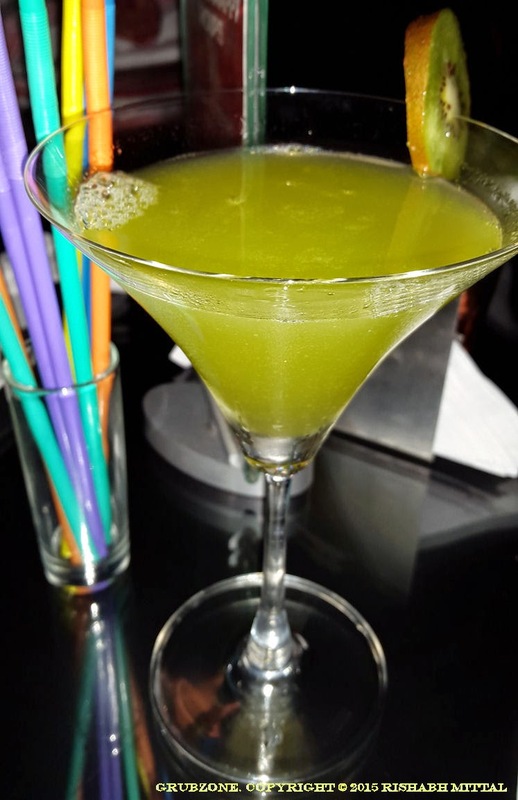 Mixed with Kiwi juice and primarily Vodka, this is a drink with enough zing and zang to get your night started on a high. Its color is aesthetically pleasing as well. Captain : I feel like finishing my long due Frankenpirate project. Crewmate : But you never started an artificial life project Cappy. Captain : Or finishing my copy of R2D2. Vanilla Sky had to be the best drink of the evening for me. Its coloring was provided by Blue Curacao. It had a light amount of Vodka and a lot of Vanilla Ice cream. The appearance rather than the pleasant blue skies resembled more of the stormy green skies. I liked the color nonetheless and its sweet alcopop like composition well meant for those with low alcohol tolerance. The taste was dominated by Vanilla and Curacao Liqueur. Captain : This be like the stormy skies from the far southern seas. Crewmate : That sky and weather troubled us a fair bit Captain. We almost reached Davey Jone's Locker. Captain : Now its time to avenge all of that by drinking it all. Spiritual Healing serves as a savior in a world of dark trance where people's faces haze out and strange hypnotic music fills your ears. Ok scratch that, in simpler terms it makes you embrace the dark side. When you are one with the beguiling hypnotica, everything is crystal clear. 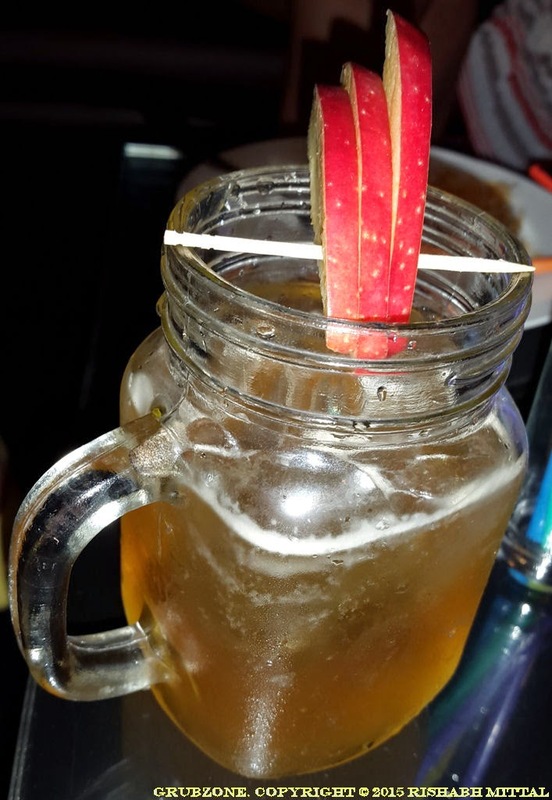 This is made with whiskey and dominantly flavored with apple juice. It blends in the tang of apple and the bang of whiskey. The resultant is a spiritually soothing and a comforting drink. Jolly Good Fellow's picture serves to show you what a barni (jar) is. It can easily pour out 5-6 drinks. Sadly for me, it didnt quite make the mark. 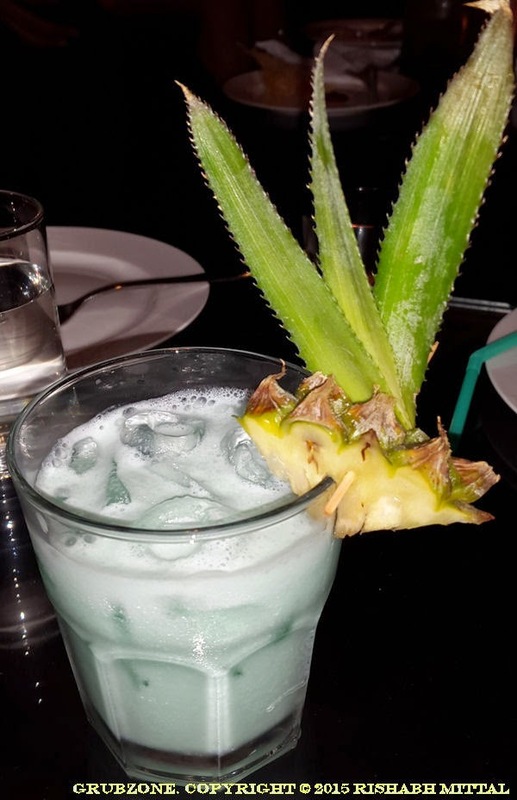 While the bitterness of the vodka was addressed by the watermelon, the pineapple juice felt like a mismatch giving it an overly sweet fruity taste. Reminds me of the old bachon ki drink advert made during cola wars. Pomegranate Martini like its name was a light hearted cocktail. 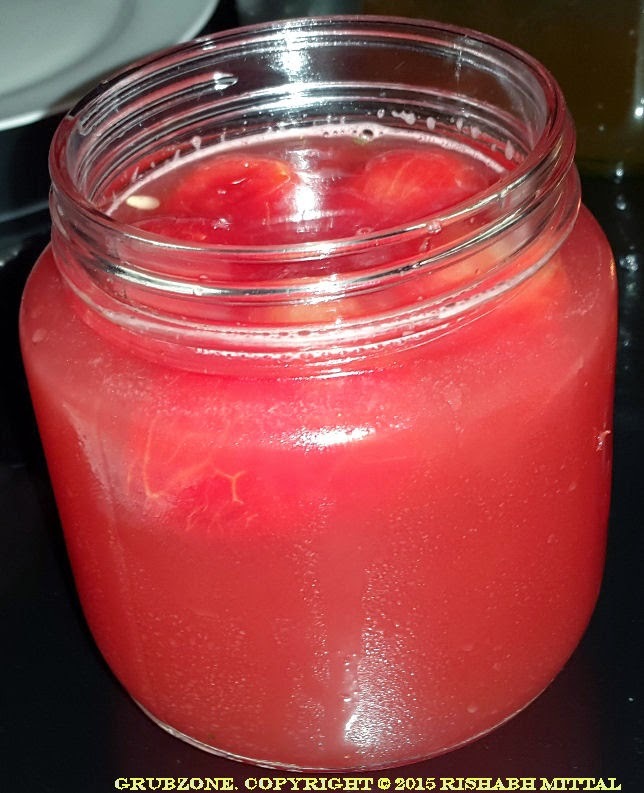 It felt very easy, sweet and yet alcoholic. 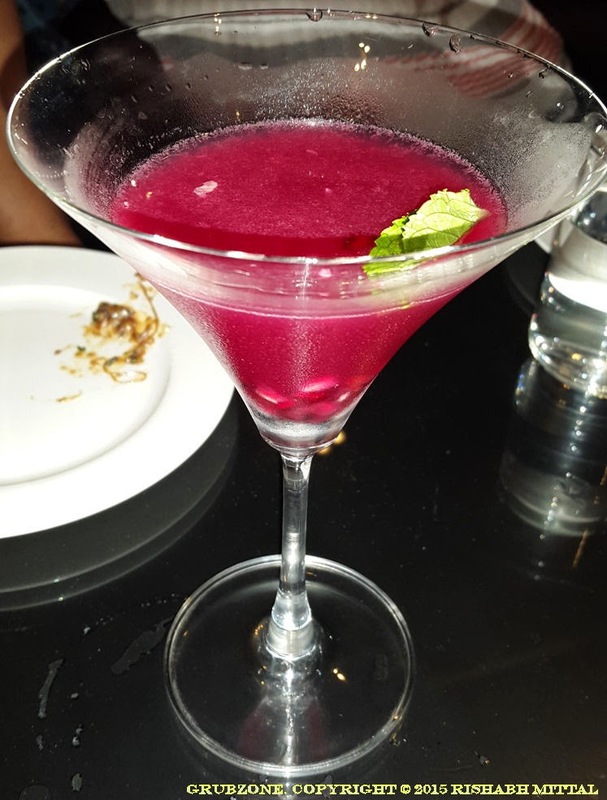 It was made with Pomegranate flavoring and Vodkatini as base. Though not particularly fond of it, I did find it quite intriguing. The best part about Tonic was that it served quality grub. One oft finds standard finger food which is average in quality and taste in many of Mumbai's lounges. Chef Ameya appears well experienced and a man who knows what he is doing. Well his food certainly spoke well for him. The drinks were fantastic but the best part was the food. Mushroom Crostini was the first appetizer to make it to the table. The difference between Bruschetta and Crostini is sadly not understood by many places which often make Crostini as extended versions of Bruschetta. The thin bread slices serve as a good little plates and one can eat the delicious mushroom toppings covered with cheese. The flavor was perfect, the plating was perfect, it was like scoring a goal in the very first minute of play. Sweet Potato Fritters with Wasabi Mayo. Another interesting all vegetarian appetizer. Made with sweet potatoes instead of regular potatoes, it scored a great balance of flavors. Its breading gave it crunchiness, spices gave it a great savory flavor and the inherent sweetness of the potatoes created a myriad of tantalizing flavors. The mayo wasabi and black sesame on each piece literally crowned these with a sense of ultimate completion. If you are vegetarian, fear not and order this right away. So much taste in such a little morsel, its almost illegal. Captain : These pockets taste great. Crewmate : Thats fine Cappy, but could you please not stuff them in your trouser pockets and leave some for me too? Tie me up is an interesting name for a dish. Though honestly it resembled "Untangle me up" more. Its inherent flavor was a bit bland. Thankfully the chilly garlic sauce bridged this gap but as a stand alone it scored poorly. 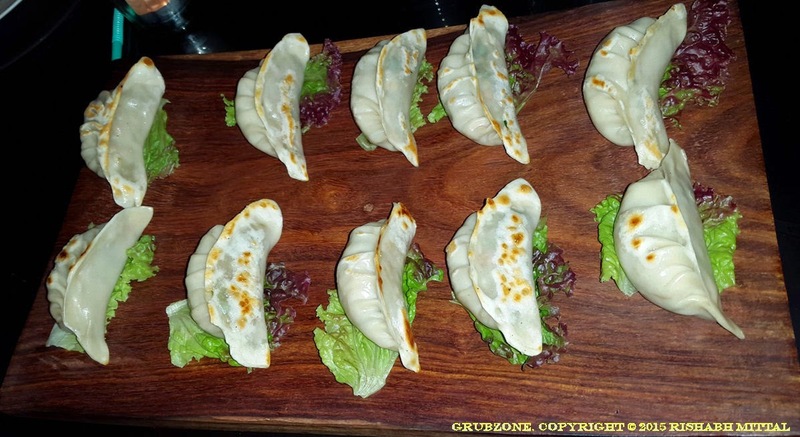 Vegetable Gyoza Dumplings is an interesting take on the classical Japanese snack. Though, it matched the visual appearance of the real thing, its flavor felt like a mismatch. It felt a bit mustardy in flavor and a bit unpalatable. I found myself unable to go beyond the first dumpling. Just when I thought that this evening will be full of grassy food, the meaty grub started rolling in. 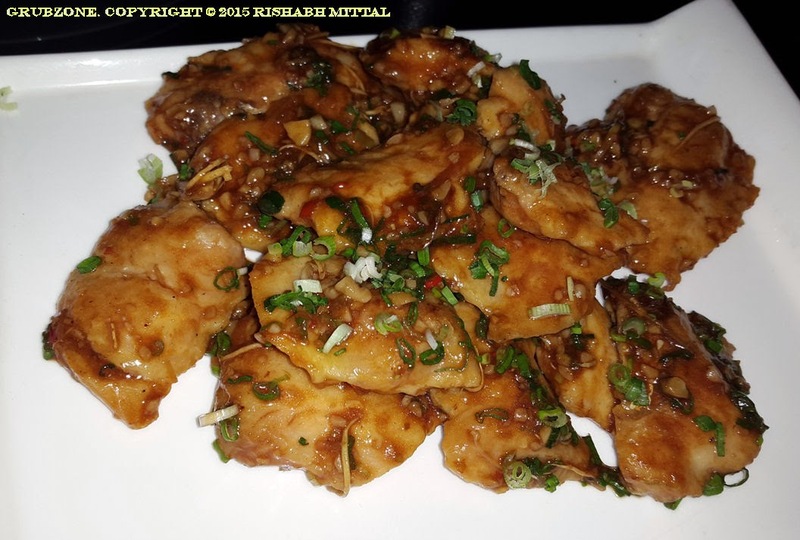 First in was Thai Spiced chicken which was made of juicy chicken pieces flavored with ginger and garlic. The final dish was then wrapped in chilli sauce. The dish was tasty but I felt that it had a wee bit of abnormal sweetness. 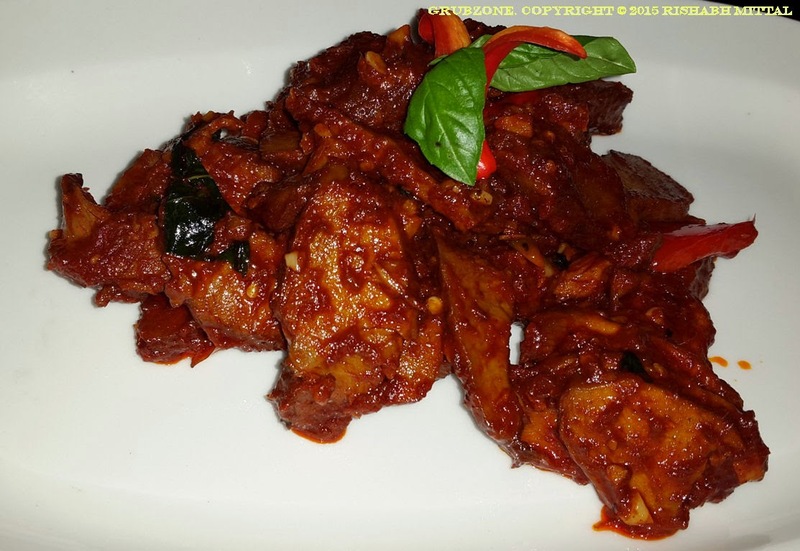 Soya ginger Fish thankfully used a different fish than Basa. This was made out of Rawas. It was then tossed with scallion, ginger paste and a bit of soya. The taste was very savory and the fish was tender and juicy. 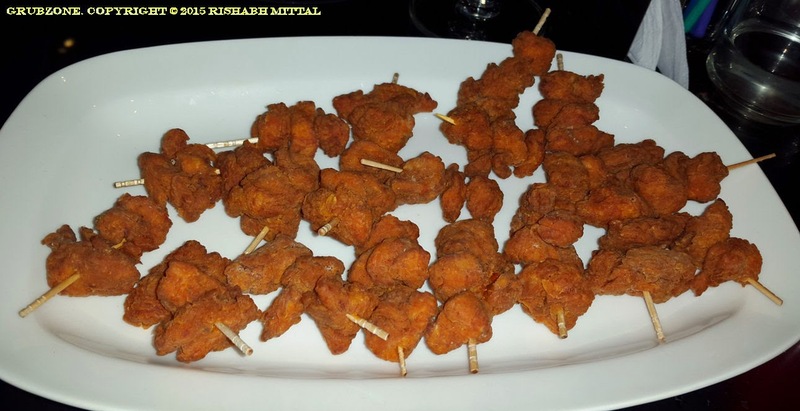 Popcorn Chicken is relatively common nowdays. But Tonic's version is several times superior than the conveyer belt grade popcorn chicken you have at KFCs. To be honest it was more of a lollipopcorn chicken with its presentation but hey it worked quite well. Not only did the texture look great, the flavor was perfect and the spices rubbed on the surface blended in well. It went great with the Wasabi mayonnaise dip provided. I found myself going through several of these in a short time. It was quite an addicting snack. Captain : I love this lollipopcorn chicken. Crewmate : Lollipopcorn Chicken! That sounds like a nice name. Captain : Oh it may become popular someday. Crewmate : How is that possible? Unless someone heard our conversation. Prawns and Calamari Crostini resembled little tarts made of seafood and Cheese. Although, it had more calamari than prawns, the flavor seemed well in sync. The item was cheesy, crunchy, salty and savory. The Baguette base added to the crunchy taste. Each bite, was flavorful and an absolute delight. 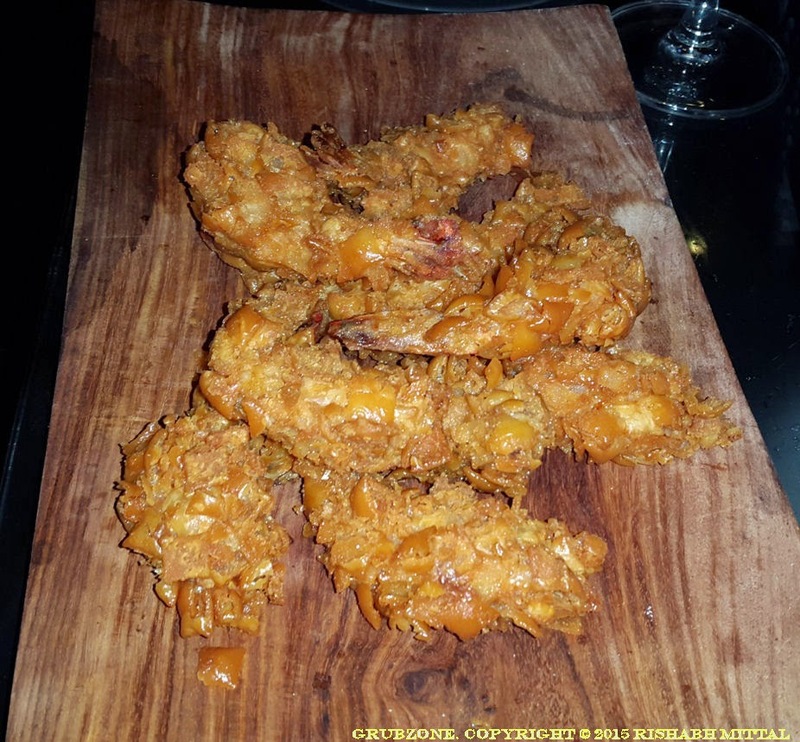 Cracker Jacker Prawns were jumbo whole prawns marinated in brown garlic and ginger. It had an addition of Barbecue sauce and was finally wrapped in a batter giving it a complex and mystifying texture. Each bite was full of crunch with rarely cooked prawns at the center. 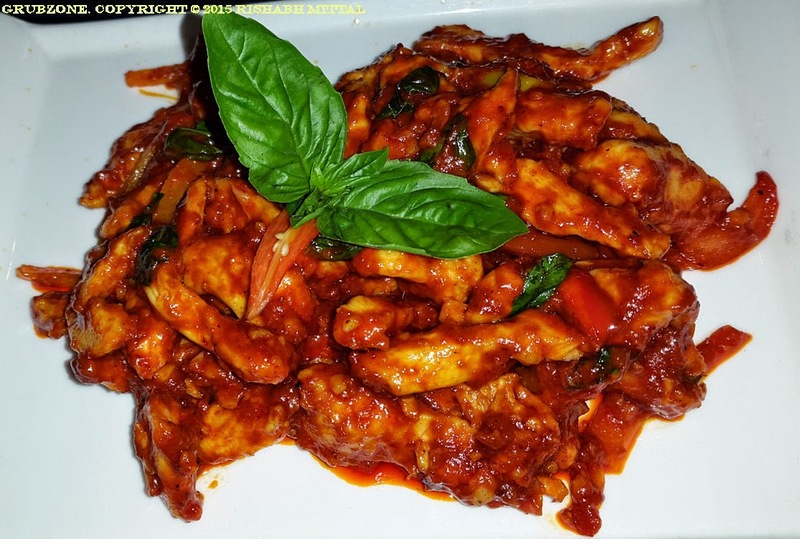 An interesting item and my first time with this rendition of prawns. 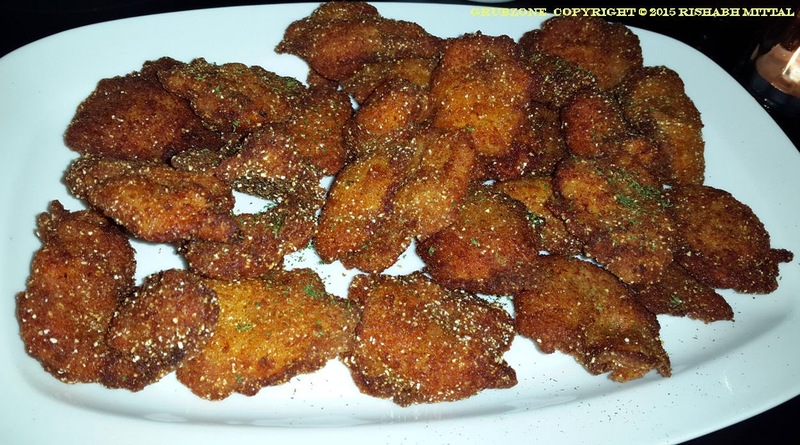 Cracked and Crumbed Chicken was the best amongst the carnivore foods. It was spiced chicken coated with bread crumbs and placed under a shower of polenta. It was then deep fried to golden perfection. It was almost as if a mountain of chicken received some volcanic dust in the form of polenta. This dish had both visual beauty and a great taste. Almost like having a superstar cricketer who is somehow a great football forward too, a true Sachin Pele-kar. Captain : Summon the great Volcano of Polenta and dip me chicken in its ash. Crewmate : This could keep the crew happy for many a nights. Captain : It would certainly keep me happy. Crewmate : I bet....hey where did all the chicken go? Baby Lamb Chilly was hot and sweet lamb cooked in a chilli garlic sauce. The bell peppers added a bit of flair but I felt that they were too less for having any profound effect either in taste or appearance. The flavor also resembled Thai spiced chicken in terms of the seasonings and sauces. You may want to be careful with this one as eating too large a portion may cause a tongue burn. Have your drinks around. The service at Tonic was excellent with Edmund and his team addressing an unruly group of food monsters with military like sophistication. Not only did they serve the food properly, they also accurately described each of the dishes and drinks. One would mistake them for being chefs with such knowledge. The pricing at Tonic could be a little high. Although the grub and grog is quite worth the experience, I still feel that they could do a bit better by shaving the price by a teeny weeny bit. The only major downside I see to Tonic is their difficult to find location. Its located inside the Famous studio lane and its quite difficult to reach by car coming from the opposite side. One has to go quite far to get a U turn to get on the right road. And other than an obscured board at the beginning of the lane, there is almost no hint of an eatery in that quiet vacant passage. Thankfully, Google maps helped me reach there without glitches as its marked clearly on that. To round this up, Tonic is a great new pub plus eatery. The environment is full of eclectic energies and colors. The food is surprisingly great for a lounge and the ambiance changes every day. The place is still fairly new so its likely to find it a bit empty. I reckon that this is the best time to visit it before it starts becoming crowded. "We are not done yet lads, there is Auriga upstairs waiting to be explored. But that is a tale for next time."